AllegroMedical.com presents The Ensure Pudding. Ensure Pudding is a nutritious alternative to other snacks or desserts. It provides a source of Complete, Balanced Nutrition® in a delicious easy-to-eat form. It is appropriate for those who have malnutrition, are at nutritional risk, experiencing involuntary weight loss, or are on a fluid-restricted or volume-limited diet. For patients on consistency-modified diets (eg, soft, puréed, or full liquid). For patients with dysphagia for oral use. "Don't miss out on the spoon-licking pleasure of Ensure Pudding. Go ahead – eat like a kid again!" Rich and creamy with a good taste. Safe, easy open plastic cups for better compliance. Good source of 24 essential vitamins and minerals. Contains 5 grams of lactose per serving. Contains fructooligosaccharides (NutraFlora® FOS), a soluble fiber. Convenient - needs no refrigeration. Fatty acids equal approximately 95% of total fat. * 1 g water = 1 mL water = 1 cc water. Contains 1 g of soluble fiber / 4 oz. Water, Sugar (Sucrose), Corn Maltodextrin, Modified Corn Starch, Milk Protein Concentrate, Soy Oil, Short-Chain Fructooligosaccharides. Less than 0.5% of the Following: Natural & Artificial Flavors, Caramel Color, Magnesium Phosphate, Potassium Citrate, Sodium Citrate, Sodium Stearoyl Lactylate, Sodium Ascorbate, Salt (Sodium Chloride), dl-Alpha-Tocopheryl Acetate, Ferric Phosphate, Zinc Sulfate, Niacinamide, Calcium Pantothenate, Manganese Sulfate, Cupric Sulfate, Thiamine Chloride Hydrochloride, Pyridoxine Hydrochloride, Vitamin A Palmitate, Riboflavin, Folic Acid, Chromium Chloride, Biotin, Sodium Molybdate, Sodium Selenate, Potassium Iodide, Phylloquinone, Cyanocobalamin, and Vitamin D3. Contains milk ingredients. Water, Sugar (Sucrose), Soy Oil, Milk Protein Concentrate, Modified Corn Starch, Short-Chain Fructooligosaccharides, Corn Maltodextrin, Cocoa Powder (Processed with Alkali). Less than 0.5% of the Following: Potassium Citrate, Magnesium Phosphate, Sodium Stearoyl Lactylate, Salt (Sodium Chloride), Sodium Citrate, Natural & Artificial Flavors, Sodium Ascorbate, dl-Alpha-Tocopheryl Acetate, Ferric Phosphate, Zinc Sulfate, Niacinamide, Calcium Pantothenate, Manganese Sulfate, Cupric Sulfate, Thiamine Chloride Hydrochloride, Pyridoxine Hydrochloride, Vitamin A Palmitate, Riboflavin, Folic Acid, Chromium Chloride, Biotin, Sodium Molybdate, Sodium Selenate, Potassium Iodide, Cyanocobalamin, Phylloquinone, and Vitamin D3. Water, Sugar (Sucrose), Corn Maltodextrin, Modified Corn Starch, Milk Protein Concentrate, Soy Oil, Short-Chain Fructooligosaccharides. Less than 0.5% of the Following: Magnesium Phosphate, Potassium Citrate, Natural & Artificial Flavors, Sodium Citrate, Sodium Stearoyl Lactylate, Sodium Ascorbate, Salt (Sodium Chloride), dl-Alpha-Tocopheryl Acetate, Ferric Phosphate, Zinc Sulfate, Niacinamide, Turmeric, Calcium Pantothenate, Manganese Sulfate, Cupric Sulfate, Thiamine Chloride Hydrochloride, Pyridoxine Hydrochloride, Vitamin A Palmitate, Riboflavin, Folic Acid, Chromium Chloride, Biotin, Sodium Molybdate, Sodium Selenate, Potassium Iodide, Phylloquinone, Cyanocobalamin, and Vitamin D3. Contains milk ingredients. Good Value. Easy To Use. Nutritional. Good Taste. Simple To Take. A Great product for daily nutrition. Good Taste. Produces Results. Easy to use with meds. Acts Quickly. Simple To Take. Older People. Daily Use. Women. Men. We use this product because it blends easily with medications. The hospital showed us this because it is hard for my loved one to swallow his medication. He likes the taste and it does a great job masking the taste of his medication. It also supplies great nutritional value for someone who does not have an appetite because of it's pudding cup size. Good Taste. Nutritional. Simple To Take. Easy To Use. Meal Replacement. Older People. Men. Women. Daily Use. Quality Oriented. POOR HEALTH. NO APPETITE. Wish it was sold in store. Wish it was sold in store. Easy To Use. Good Taste. Nutritional. Easier for elderly individual to swallow and enjoy than liquids. Easy To Use. Nutritional. Simple To Take. Quality Oriented. First Time User. Rarely Workout. Do stock/sell EnsureEnlive? I was given that while in the hospital and really felt the difference in stamina & strength. 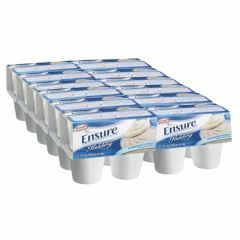 MY PHARMACY USED TO BE ABLE TO GET THE BUTTERSCOCHFLAVOR OF ENSURE PUDDINGS. DO YOU SUPPLY THAT FLAVOR?